This article serves to answer the question posed in the title and as a review of the Writer's Digest Book, "Blogging for Writers." The book is available here from amazon. I've had this blog for about seven years now with limited success. Mostly because I claim this is a writer blog but all my commercial writing thus far has be distributed in another genre using a pen name. I'm hoping to change that in the near future. Unfortunately, this blog has been, more or less, a hodgepodge of fleeting thoughts I've managed to hold onto long enough to put onto the screen. Truth be told, as a writer, blogging made little sense to me. 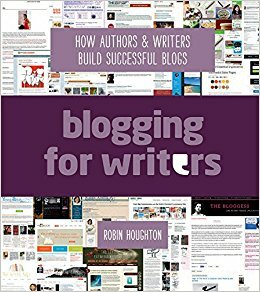 So, I'm wandering through the local bookstore and spot this book "Blogging for Writers" from Writer's Digest books and thought that it might give me some insight or magical formula to couple my writing desires with some tangible blogging outcome. This book is 176 pages and filled with pictures and links to successful writer blogs. Other than that, the information contained within is rather general but applicable. I don't mean to use the term "general" as a negative. Rather, this generality is what helped me the most. The book literally starts at the beginning, explaining the history of blogging, what the word even means and the basics of how to get started. It explains the differences between the different blogging platforms (mainly Blogger and Wordpress) and reasons to choose one over another. I must say, at this point that I am not advertising this particular book over any other. I just happened to pick it up and provide feedback to its usefulness. I also must say that I am somewhat partial to physical books for reference over digital. That's just me. I like to be able to highlight, dog ear pages, make notes in the margins. I also compared most of the information in this book with my go to source of writing information: Jane Friedman's blog. Specifically, one particular post from long ago about blogging found here. The one thing I like about Jane's blog post is that she states that if you don't like to write on a blog, then you shouldn't have one. While Jane's blog post serves as a guide to get one started, Blogging for Writers is like a detailed road map with GPS voice directions on how to get through all the little details of blogging. It takes the would-be blogger from how to start a blog, including naming the blog and deciding what the blog will be about (something I never did) to monetizing a blog or selling your work. The only negative I found with the book is that some of the specific information provided is outdated since Blogger has recently updated some of their features. For instance, I loved the section on tying the blog to other social platforms but ended up nearly destroying my page because I didn't realize that blogger had recently combined the share buttons into an icon resembling something one might see on their phone for sharing. I would recommend this book to any writer wanting to expand their influence and reach by blogging. I'm using it as an ongoing reference in order to improve my own blog and will put more emphasis on tasks I never thought of before like creating a blogging schedule and narrowing the scope of the blog. As far as blogging advise goes, The takeaway I got from both the book and Jane Friedman's blog post is that one should post on their blog at least twice a week, at least until they gain enough of a following to create more in depth posts with less frequency. Do you have any advise about blogging for writers? Anything you have personally found that works, or doesn't work? Let me know in the comments section.